I like how easy it is to navigate Trulia’s app. The pictures are high quality. The Trulia app is so simple & easy. I really like it! Seems to be improved since last year. Now easier to use. Clear, a tone of options . There is no option to report scam listings in Trulia. There used to be an option, but I guess Trulia doesn’t value its customers enough to enforce any policy to control the quality of the content it provides, since that option no longer exists. Like the app. The draw back is a lot of information is inaccurate. So property are no available. Mortgage calculator should include potential Property Mortgage Insurance ( PMI). This is important because it could change your mortgage approximately $300 for a $300,000 home and again approximately but it is very deceiving the way the current calculator is calculating the homes For someone who is putting a down payment of 3.5 % under the FHA loan program which are many people.Thank you for the opportunity to comment. Makes searching quick and easy! I can browse lots of properties and see everything I need to know in a matter of seconds. The interface is very user-friendly and the pages are laid out well. So far so good! I have no complaints . Hopefully I’ll find a home of my interest!! I love Trulia it’s a great App better then the others. I like Truila, But I Want Ranch Style Houses and they Have 3to 4 Bedrooms and Built In 1990s -2018 Least 2 bathrooms, my Preference is Boca Raton 33428 and Palm Bay, Orlando and Del Rey Maybe, But Thank You For most Of The Houses You’ve Sent. Excelente app para buscar desde casas a la venta y para Rentar. I don’t write reviews but this app was ridiculous. It never showed me houses in the search area I wanted, it showed me houses in search areas from YEARS before. The last search I did actually showed no houses for sale in the whole town I was searching. I even worked with an agent through email and changed my preferences and it was no help. Investors need folders. We used to be able to create clipboards and put group homes that we like. You erased that feature and now my saved homes are all one place. Other than that I like the app. For rentals and sale anywhere, best app I have found. Keeps you up to date on areas of interest. Easy to use with filters for your preferences. Trulia is very easy to use and manipulate data to find just the kind of place I’m looking for! From finding properties in my desired school district, to finding out which areas are the safest or not the safest to live in, and also where to find places to eat...perfect for those moving to a new area. Trulia has it all! Great app makes house hurts easy and fun!! Since I’ve downloaded this app, initially looking for coastal retirement home in an area of the country I’m not terribly familiar with, I’ve lost days and days of my time. I open the app, I begin searching, and the next thing I know 10 hours have gone by and I want to keep looking! Searching for a home, naturally, takes a lot of time. But this app has allowed me to become so familiar with home trends in places I never thought to look that I’ve expanded my search to pretty much the entire country. I’ve tried other real estate listing searches and none of them compare to the information this app brings to my searching finger tips, on a whim. The only reason why I gave it 4 stars rather than 5 is because it does not allow my search to expand outside the USA. I mean if I’m looking for a coastal home, why wouldn’t I also consider the Caribbean, Mexico, South America? Why doesn’t Trulia provide those listings? Get to work folks! Easy to use, and frequently updated. The app just works. Fast, great updates, no glitche! Would like lot lines added to trulia like Zillow has. I love this tool.it’s convenient and easy to find the houses or apartments.I got my Ideal home a years ago by this app thank you so much. I love this app it has great feature like Street View, it gives you a good sense of the neighborhood. I like so many other features that I deleted realtor.com and Zillow.com. Not sure why, but for some reason LGBT friendliness has been integrated into real estate as far as this app is concerned. Still not sure how it relates but it just shows this app is compromised by special interests. This app was good until the latest update. Where has the natural disaster feature go? I really like the app. The part that is frustrating is that I can’t mark off listings that I have already decided I don’t like. I keep trying to unsave old homes that are no longer on the market or from years ago and it does not remove them. Very annoying to have to filter through a huge list of saved homes that I no longer am interested in. I love TRULIA! It’s an awesome site that shows you houses that meet your criteria. I love that this app shows crime rates!! I have used various RE apps. Each has their own best features. So far none is good enough to stand alone. When you are looking for a new place, Open Houses can be very useful. Yesterday, on Sunday, there were many available midday. I did not get email notices for them until close to 8:00PM, hours after the OHs. If they are going to be emailed, they need to arrive hours before the OH, not after. Application doesn’t even load homes, and that’s the apps job... use Redfin or Zillow. The latest update has major bugs and need fixing ASAP. Won’t generate a search for me and tells me to check my internet connection when I have strong internet connection to begin with. Used to love this app. Doesn’t work at all now. Have tried deleting and reinstalling, nada. The app seems to have problems. It won’t load alerts, I frequently will click on a House only to be told “something went wrong” or there’s no data. My biggest frustration is using the draw tool on a map, it always says there are no results with my filters applied. But if I remove the draw tool, same location, same settings, I get hundreds of results. The app is just plain broken. Latest update, there are no homes found anywhere I search or it times out. App showing no homes for sale in all of Dallas_Fort Worth. Cleared all filters & hit apply. Still nothing. Deleted & reloaded app. Still nothing. Tried to send feedback via app support. wouldn’t load. Trying this now. I being used Trulia for quite some time and I love it!!! Trulia offers great information on homes on the market and not. It’s an invaluable way to check on what’s out there and learn more than just the prices. The home seeker can learn the history of the property, garner information about the neighborhood, study demographics, and more. Trulia will do the searching for you, and Trulia will give you all the details you need to make a good decision about where you want to live. If I am searching for a unit that is under $2000/mo, why are the other recommended “similar” rentals between $3,100-$4,800??? That’s no help at all, figure it out. Enjoy the daily updates! Thank you!! Love Trulia. All the information any house hunter needs. Don’t waste your time. Go to Zillow! Poorly designed app! No way to really narrow your search down like you can on Zillow. Literally put in 10plus acres between 0-300,000. I searched all of Florida not one house popped up. Zillow had 100s, deleted immediately. The Software requirements is just ridiculous. You can't even run this software on older iPads. That's just insane especially for such basic software as this. This right here is why Android is far superior. When actually attempting to use the app to find a house to purchase in a short time it gets really frustrating. The ability to manipulate the search filters and locations makes it useless quickly. It seems that once you create a search filter you lock in a profile forever. I could not delete locations that I was no longer interested but the app thought I should be. Try again, if you can. Love this app. Very convenient for investors looking for rental properties to invest in. It gives all relevant info at your palm of your hand. Makes it so easy to see current homes for sale and rentals in any given city or town. Makes it easy to contact the owners or real estate agents. Easy to use interface I’m moving out of state soon and I’m finding my new home with this app! The app is okay there are great houses but it tells me that there are over 200 houses in my area.. but when I do the “draw” option around my area it tells me theres none. I’ve been using the trulia website and finally downloaded the app to browse homes on the run. It has all the most useful features of the website I like and works smoothly. The Application is able to find a decent large area of people homes to with Rent or Buy. Wether they are younger in college or up to 50 could use it. Enjoying the optimization and match cues for its users. 👍. You could make the ability to search more friendly. I have used Trulia for years and have never been disappointed. You can always count on Trulia to give you the most updated and accurate info on real estate. I just start using this app and it’s been so helpful. Give me all I need to know about housings and the surrounding. I love this app! It’s very user friendly! I gave it only 4 stars because it doesn’t include what school system the houses are located in. For our family, the school district is a make or break deal! Other than that, I love this app! I really enjoyed the app and what it has to offer. The only thing I wish it had was the ability to be a little more user-friendly in terms of knowing how to navigate it. Doesn’t have quite as many options in terms of navigating at least does not appear to be because you can’t find it if it exists, compared to realtor.com. Like the app but, I don’t want to see rooms when I’m looking for apartments!! I have been looking for homes in Oregon and this weekend I checked out the homes I saw there, and their descriptions were spot on! I’m looking for two family homes ( two units or three don’t see any I have requested but still see none. Thank you in advance. The map was very slow to move and I could not access information about properties easily from the map. Deleting this app. Please make a comments section so we don’t have to waste time looking at piece of crap houses. Show lot lines like ZILLOW! Only thing missing! App crashes a lot. Properties are not updated. Most are sold or pending. STILL a piece of crap app. Deleting and downloading Zillow. They’re are very helpful & precise, thank you for all your help!!!!
. We live own fixed income . We own our home In Comanche , Texas. But we can not afford $160-up . We want a nice home. Taxes here in Comanche is horrible. We have to pay 1900.00 a year . Custom draw area does not work. Comes up with no results. Happens on both my iPad and phone. I am thinking of relocating and Trulia shows me lot of choices everyday. Wonderful app, use it all the time. Could use more info about condo fees. Helps me locate property while sitting in my living room! After updating the app is bad! Submit button doesn’t do anything. Can’t sign into account on either iPhone or iPad. I like using this app! We have been using Trulia to run market comps in multiple areas. It is great to have crime, schools, amenities all in one place. Such a useful tool. I love trulia because it is trustworthy. I can trust that the property is what trulia has listed. Trulia saves me time because there are usually pictures to view for most properties listed. Very easy to use and user friendly! Overall a good app, but please add the ability to enter personal search parameters on the price (or at least narrow the gaps in the preselected parameters). My max price is $325K, however I have to search on the pre-selected amount of $350K which is a big jump from $300K, and I end up seeing houses over and over again that don’t meet my criteria. I’d like for my feed and alerts to show only what I’m interested in, as it takes way too much time to sift through these every day! I love the app! I just wish it showed the bills estimations like it does on the computer website. I really like this app. It makes it way easier to search for possible homes rather than thru the web browser. One thing that does bother me and the reason for 4 stars is that the app doesn’t tell you weather or not a home is pending a contract. It’s made it frustrating when booking times to check out the house only to be told it’s in contract. This is the best home finding website ever it has so much information on bunches of homes-condos-apartments-studios- etc. A lot of changes were made to the app in the most recent update that weren’t that great. I regret applying the update to the point I don’t even want to use the app anymore. When I search for a specific address now I get a map boundary of the area the house could be. It’s like a game which green oval on the map is the house I was looking for. Before I could search an address and it would pull up the exact listing. The history of what you have viewed is gone. Previously you could click on a house it would turn grey and remain grey even after closing the app and reopening it. Now the app only maintains that history until it’s closed. I used this feature every time I used the app. It was helpful in knowing that anything green was new. Now I have to click through everything looking at 100 houses I’ve already looked at. The amount of detail for each listing is gone. Before you could tell the exact type of heat and air conditioning a house had, central, forced air, radiant, etc. now I get a yes or a no whether the house has heat or ac. Along with this you have two categories cooling system and air conditioning, what’s the difference? Cooling system is always yes whether a house has central air or not from what I’ve seen. Cooling system can be yes and air conditioning can be no, it doesn’t make sense. This app is very informative,tells you what you need to know about home searching.and gives you plenty of information concerning homes. I keep getting messages from people who is not real but they want you to transfer the money! Waste of my time. Whenever I spend time putting in the exact search criteria I want in my future home/property and hit apply, it's like Trulia is saying, “Yeah, I know you think that’s what you want, but, here’s a whole bunch of random stuff for you to look at while you try to fish through the thousands of properties that spent more money to be featured here to get to what you really want... so have fun. Also, just to mess with you, I’m really reeeally slow...” It is sincerely aggravating that none of the featured properties hit ANY of the not-so-out-there criteria that I’ve set. Land and a bathroom, basically. And I get a .36acre property in the city. Less than a star. Love this app. Enjoy reviewing all the houses. Feed now only says check WiFi connection. It doesn’t work after this last update. It’s awesome and very great for everything Thank you. Can you include an option to get rid of foreclosure auctions that have NO pictures? It’s very aggravating to click on so many things for sale & wasting time, only to find there’s no price or pictures. It shouldn’t even be on the site to begin with. We bought a house we never even saw in Boise, Idaho. We trust Trulia and the information we got was enough to go ahead and buy. Love this App! I usually enjoy this app but they’ve had many updates and a one has been a problem for me. It’s frustrating that they don’t have the individual boards for saving homes in different places or creating boards to your liking to separate them so they are easier to find again. They got rid of it months ago and I tried getting accustomed to it but it’s time consuming to scroll through the entire list of homes saved just to find one particular one. This is a great app that is perfect for locating houses for sale in the area. It’s pretty up to date. Properties are not being updated properly or fast enough. It is more up to date than Zillow. The filters work well. We have a COLDWELL BANKER realtor but I find that the Trulia listings are far more helpful in terms of the way information is given and pix are presented. It is good and gets better every week and every update! The only okay thing about Trulia is that you find “Open Houses” list than Zillow, Redfin, Realtor etc.. However, when you’re looking to buy a house is lame for their stuff is not updated or they’re not up in the roll. So many apps out there- go crazy search because you will surprisingly find more updated houses on sale than just sticking with one app for instance - Trulia. So far the one I like is Zillow (no wonder they have million app downloads). It would be good if you guys can move faster to take down the properties that been sold, instead of having there for sooooo long. I love looking at property and sharing it my social media, the only thing I think it could be better is through virtual Avakin/Avatar tour maybe you could partner with Avakinlife to help bring your properties into to the future. 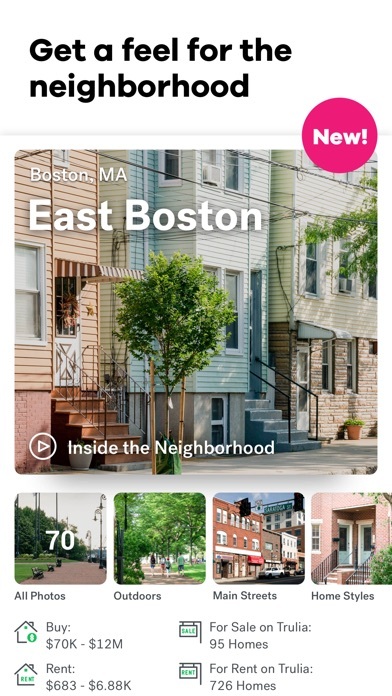 Inconsistent titling of neighborhoods, yeah, it’s all Boston. Tell me the hood! It’s so easy for the all users!! I love this app!! It’s not a bad app but it needs to include estimates for the real house price and rent like Zillow does. I liked this app due to it tells you crime in the area, but I looked in an area there is a lot of crime. Shootings daily robbery’s. You can just check the news. And it says no crimes have been reported. So I checked more and more houses in same area. Still no crime rate. So if your buying a house based on crime rate. Please look into it more than just an app. 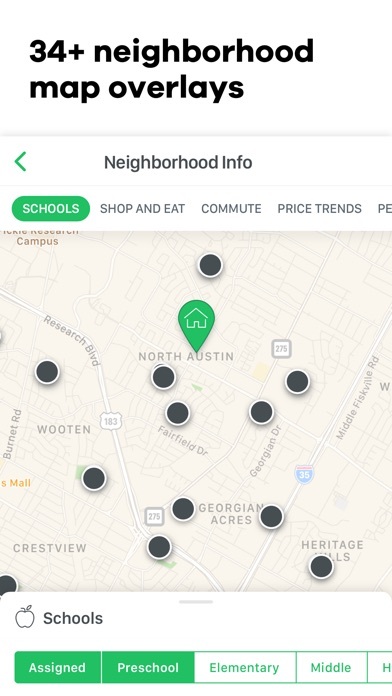 Have a way to filter out the 55 n over homes available. My saved homes section is saying I have no homes saved even though I can see the ones I have saved in the search area. We are looking at homes since we are moving soon and it is a time saver. Almost additive! Very functional and fast on a computer and mobile device. Found our dream home on Trulia! Closed on it a month ago couldn’t be happier with this app! We were making a move several hours away, so spending endless days looking at houses would not be possible. This app allow us to view homes and narrow down our search so that when we did make the trip, we were able to actually find the perfect home in a day! For a family that has moved as many times as we have, this was a huge time saver! The app is okay there are great houses but it tells me there’s over 200 houses in my area but when I do the “draw” option it tells me theres none. Works well and is easy on the eyes. Trulia, I really love this app and find it very helpful! Thank you! The only reason I gave it four stars is because there isn’t an option to remove the house from the listing, you already viewed it. So much information in one place! I love the one click feature, takes the stress of home search away! While Trulia gives a lot of details, a lot of it is inaccurate. My home is currently listed, and under every appliance it says, “No.” However, all the appliances are included. Fortunately, my house is closing tomorrow, but maybe more people would have wanted to see it, if the information showed correctly. Tried a few real estate apps but always use Trulia. Excellent app! This is probably One of the most comprehensive site that guides you through researching selling,or buying real estate simply great. Has more houses available than other apps I’m using. They only thing I don’t like is the display page. It makes it harder to look at. I would like It more if it was a list view. I enjoy using trulia it’s very easy to navigate and see everything in one place. Only dislike is they keep showing me houses off the market. We are first time homebuyers, this app is most helpful and advanced in real-time, I love the street view option !! It gives us a jumpstart to do our drive by to see if we are interested in the home and neighborhood without waiting for the realtor. We like that we don’t have to wait for the realtor to send us a listing from the MLS. Looking forward to finding our forever home with the help from Trulia app . Future Homebuyer. I love the ease of the app however I wish I had the option to “delete” houses in my search that I’m not interested in. I guess the only people they are concerned with serving with this app is the LGBT community. I deleted this app and will be using Zillow exclusively for my house hunt. I never expected this app to be so GREAT! I thought it was just gonna be another app that shows random houses. But indeed its impressive and useful. Occasionally I look on it because it’s so satisfying to see it very organized. Don’t mind interface, but recommendations on feed are HORRIBLE. Of 10 homes recommended 7 were either off market or pending. Recommends House way over what I’m looking for and in areas I’ve never searched. I constantly am being asked if I want to leave the app because the ‘more’ link is to close to the ‘driving directions’. Otherwise I love Trulia. I definitely do like it (I switch back and forth with Zillow) but it needs a button to be able to hide a property like Zillow does. I don’t like seeing homes I don’t like it makes the map too crowded. I liked Trulia, until I came across it pushing its liberal views. I wanna look at houses not rights on gender identity and such.. disappointing.. This is one of my favorite apps. Very comprehensive home searching app. I frequently use this app to search for homes. It would be so nice if you could delete the houses you weren’t interested in. It’s so frustrating to continue to see the same house that you know you’re not interested in. Need a filter to be able to screen in/out below market rate/income limited properties. I've been looking for a small place in Vt, I was born and raised there and this app is making my process fun and easy! Apartment prices on this app are inaccurate. Don’t be fooled, just wasted a lot of time and to call the property managers is difficult. Deleted the app. Trulia’s app is pretty good! I dont have much to review due to this being a recent download, but i am pretty impressed with what ive seen so far. What’s the point in using this, if it shows apartments that are no longer available and, doesn’t even show new rentals? So easy to browse, portal is easy to understand, very organized! We are thinking of moving and we use Trulia to research the area. It makes it very easy. Thank you so much for creating this app. Being able to see so many places, prices and geographical location is wonderful! Thanks ! Easy to use and navigate. Wish you could filter by school district. I have asked to see or talk to someone on 17 houses and only one answered!!!!! ?????? Why? Love the way you can search all over on the map. This is the only real estate website that I use. For me it’s three stars because I cannot figure out how to search areas with filters like shop and eat, crime, schools, etc. Maybe this is user error - or maybe it’s not possible on the app for the iPhone. Either way, it’s not intuitive enough for me, and it’s one of my favorite features on the Trulia website. I’m concerned regarding the estimated value of my home at 3409 Bathurst Ave. 93313 The price listed is $1,800 for a 2,965sq ft, 5 bedroom, 21/2 bath house which was built in 1992. Easy to find properties, accurate, just great overall!! I love how they show the price on that map before you click to actually see the house. It allows you to see the the price range. I love Trulia! The only thing i feel like it’s missing is an easy way to search specific areas! I love the heat maps for different criteria! To use the app you have to create a password. Really? I need another password like I need a hole in the head. And when you want to share a listing with someone else? They can’t open the link unless they also create a username and password. Zillow app is much easier to share with others. Todo está bien, tiene casas en florida? I appreciate that there is a wide range of listings to find, but I don’t like that when you unfavorite a listing it keeps showing up in the favorites list. The app is rather buggy. This is how I found my dream home! We used Trulia for almost two years leading up to the purchase of our first home. It was a useful tool to research neighborhoods and get a feel for the market trends, crime, schools etc. Nothing can replace seeing it with your own eyes, but it is a good jumping off point. The home we ultimately purchased was one I found on Trulia. Actually, the realtor we used was one who contacted me when I requested information on the house, and he was amazing to work with. Everytime i open app it just continues to crash. Lazy programmers not keeping up. Very disappointed. I am searching for homes with a specific amount of acreage within a certain driving distance from my place of employment. The Trulia app will not allow me to select “farms” or rule out manufactured homes. It also shows “fake listings” for two and three bedroom homes, complete with photos, that are actually vacant lots with no house on the property whatsoever. Other apps are much more useful and accurate. This app helped us look at many houses with much detail to find our new house. This app is so worth it. I got a great deal along with an amazing apartment. You need to do it. Does not update properties as quickly as other apps. Compare to realtor and Zillow the market updates MUCH faster on these apps than Trulia. This app is a waste of time. I used to use the Trulia app all the time because I move so frequently and I always recommended it. Though as of late, any search area I type in results with “No homes in this area.” I’ve reduced the filters, cleared them completely, even searched random cities and nothing. Disappointing. I hope trulia is reading this and will fix the issue. (Yes, I’ve uninstalled and reinstalled the app). App keeps quitting on me. Does not appear to let you fix incorrect information that it shows for your property. If ours is wrong, then I’m betting that many others are wrong as well. Sorry, but we prefer Zillow. I upgraded my phone to iOS 11 from iOS 10 just so I could install this app which requires iOS 11. Which I’m not excited about. Unfortunately, the app does not appear to support login with a google account, which is how I set it up on the web site and how I can access all my saved stuff. So now I can’t access my saved houses, etc., and I’m now stuck with iOS 11 which I was avoiding. If you used the google login feature of the website, don’t bother with the app. Trulia website is easy to navigate and has valuable information. The mortgage and tax information is very good. This is a very good app, I like is that. For a long time, Zillow had the real-estate app of choice. But while their app has grown stagnant, the Trulia app has blown it away in terms of functionality and user experience. Trulia makes it so much easier to see new houses on the market and other houses that I might like. And it actually uses the right real-estate tax amount in the mortgage calculation, unlike Zillow, which is inexplicably always wrong by about 50%. I would NEVER use your app! The fact that you have a child egging a house in your advertisement is disgusting! How do you think this is going to give this app a positive representation? They should make it a "must" to list the HOA fees. It takes so long to find out what the fees are, why not just add it in there and make life less easy. Also the square footage of most houses are not even in there that's another reason to contact the agents and be bothered with them with millions of questions. Best app I ever had.. Wish i could filter by HOA or not. Very well designed app. Hope to find a new home soon. The boards/tiles were the key difference in organizing listings (I had up to 5 different cities) and Trulia deleted them overnight. Bad analytics and metrics to come to that decision (as per the many outraged comments on the web). I love the site, but when I go into my saves on the app and remove some, they’re back once I refresh. Makes it kind of hard to narrow down the list. I constantly have to remove homes that are saved and no longer on the market. It's a nuisance. Also, there is lag time between off market homes compared to other sites. Easy to use no matter where I am. The MLS is a centralized database for all residential real estate listings. It can be updated by a realtor anytime, and the changes are reflected on that centralized listing for all other realtors to see. However, sites like Trulia and Zillow do not update in real time with the MLS. So it is impossible for potential home buyers to see relevant changes to the listing after it his first gone up. The address is listed on two separate lines so the map view may display the same address in a different city depending on what comes up on top when doing a lookup. We listed a property in Jersey City but map and street view showed a Hoboken address. Customer service said to enter the correct latitude and longitude. How about fixing the app to let Google Maps know the zip code at least? Genius! I have always used Trulia when looking for homes/apartments. I solely used Trulia to find the apartment I live in now but while looking for a home to buy, I cannot help but be absolutely frustrated with the new formatting! Every old saved home won’t unadd, the app lags, glitches, and crashes, and the drawing feature is ridiculously over sensitive. I miss the old Trulia. My sister feels the same exact way as I do. Definitely deleting the app and returning back to Zillow. Two huge thumbs down. This app needs one main feature, hide/ignore properties we aren’t interested in....see Zillow for an example. It’s too cluttered if all the same properties keep popping up on the map. PLEASE include a filter for # of garage spaces! # of bedrooms and baths are filters but why not # of garage spaces? This is a very important filtering criteria but none of these real estate apps feature it. I want to see only houses with 3+ garages. At first I loved looking on Trulia but the last several times I have thought I had found a amazing house to go view with my realtor I came to find out that the house was already under contract...... but Trulia still had it listed as available and active....Very frustrating. I love the layout and the features of Trulia so if they could fix how fast they update the status of properties I would get on there a lot more often. Trulia is great! It has more listings than Zillow at times but I’m so tired of looking at the same listings over and over again! I’ll see a house I hate and wish to hide it so I can only view the new ones coming in. It’ll save everyone time if you just add a hide button. Or at least have a separate tab for new listings based on your filters not like recommendations, those houses are out of price range and usually out of the area you’re interested in. Along with location, condition, is how price of a property aligns with area comps. Unlike Realtor, Zillow, It’s impossible to see sold properties in Trulia. That renders all the other admittedly nice features of this app almost useless. Get with it Trulia, show sold properties! Viewers just go to realtor.com. Trulia is at least two weeks outdated with pricing. The app crashes at random times and when reopened does not pick up where you left off. Very annoying and makes the app impossible to use. FIX IT. Overall, this is a pretty good app. I like the concept of seeing crime rates, school zones, commute and shopping all in one. But I’m having issues finding my saved houses. I just searched and found a couple of houses that interested me and saved them, went to my saved list to show my husband later that night, and it said I didn’t have anything saved. It kinda frustrated me but at least I remembered the area the House was in so I could find it. Please fix. I truly enjoy this site> Love it! The colors have changed since I've been on the app. The colors for the crime maps used to be green yellow and red I believe and now there's this awful light blue. I can't see anything! It's terrible. Change it back is my suggestion. Normally I can see the map but now all I see is this blinding light blue. Way too complicated now miss the old Trulia. Easy to search once you put a town in ! I like this app because it has a lot of options, especially viewing neighborhood data like schools and crime etc... However there is a huge problem of moron jerk faces posting “lot” or “land” that “would be great to build on” and crap like that on home listings. Additionally when builders list “not yet built” but list “plans and a lot”. This is so frustrating and these listings should be pulled. They should have their own section for people who actually are interested in that. This app would be 5 miles ahead of all other platforms if they would add the ability to “report” those listings, to be pulled so that everyone doesn’t have their time wasted by lying manipulative jerks. Perhaps if a certain user gets 3 or more flags in a given time they should have their account suspended. This is an ongoing problem lately and I’m sure I’m not the only prospective buyer getting mad about this. Realtor.com is a lot more specific when it comes to filters. 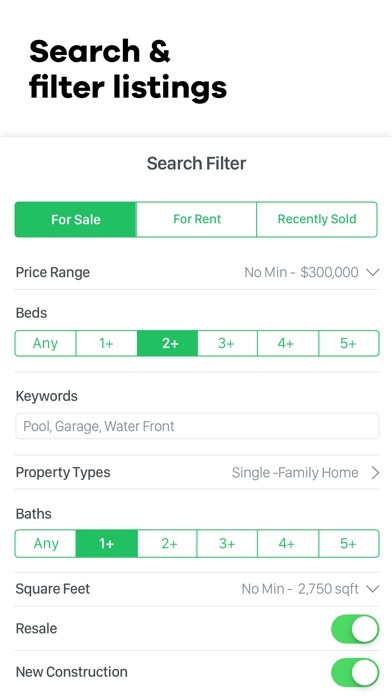 If I select pool In the filters I should only see homes with pools, instead community options come up, and I’m not interested. After the most recent update, all of my "hearted" properties disappeared. When I look for them and click into them, the heart is there, it's just not showing up in the heart tab at the bottom to scroll through. Really odd... Please fix. Amazing and clear help to people when they are interested in buying, selling or renting homes. It’s interesting and has help me see the opportunities to buy a home. Thank you so much for your help and work towards us. I have enjoyed using Trulia for both serious and casual browsing. It’s easy fast and best of all - no ads!! Terrific site! Gives you large varieties of options whether you’re renting or buying. Convenient emails letting you know new listings almost as soon as they are listed. Definitely recommend!! Basically if you don’t meet their requirements your just better off going somewhere else to find help. This is my favorite app for looking at homes, but I can’t delete homes from my favorites list which is very annoying! Could you fix this issue.... when I deselect the heart it should delete from the list. Not as easy to navigate as Zillow app wise but offers more detail. Very difficult to swipe through options as the app isn’t very intuitive. The interface of the app is decent, but the property listings are so out of date. Houses that have been off the market for weeks are still listed as available on Trulia. This makes it fairly useless as real estate tool. I’ll be deleting this app. I love using the Trulia app because it provides me with all the important information necessary at my finger tips. It seems that they've "improved" it into uselessness. Open the app, good...but touch it and it runs and hides behind the home screen. Bring it back, touch it anywhere and it's gone again. COMPLETELY useless!! Before you view property overhead and see what was surrounding your area. Like rivers, main highways etc. Also you check for tornados or floods. I use to love Trulia. I don’t like it anymore. This app is never up to date and it’s too slow for the area that I live in. By the time you update the app the property has already sold. I do like how it has some things listed that others don’t. But it’s a matter of hours before they do. The best real estate finder out there. Viewers just go to realtor.com. Trulia is at least three weeks outdated with pricing. If an agent needs to be a member to update pricing then this is just a money making scheme. They are NOT in it for the good of sellers and buyers! + Love the maps that give me feedback about the demographics, crime, etc. + The app is easy to navigate and user friendly. + The listings are quite extensive and options for both rentals and sales is great. WISH - Would be perfect if the filter allowed me to remove any HOPA listings. So disappointing when I am loving a property then realize it is only for ppl 55+ Thanks for this app! Good but, could be GREAT! Does not have newly listed homes. I usually have to find them on Zillow then plug it into this app. The app had been working great, now all of a sudden I keep getting message that says, “please check your internet connection and try again,” in the Feed tab. I can still search, but that’s all. My internet is working just fine and I’m not having problems with any of my other apps that use internet. I’ve tried swiping down to refresh as suggested, but still not working. It’s been like this for about the last 8 hours. I’ve also rebooted my iPad to see if that was the problem and same error message. Please fix! Need to identify management company. Some are not very good and feed you full of BS just to get your processing fee, they’re possibly getting a kickback. I have used the app for rentals and homes for sale. I love the format and the ease of moving from the map to pictures and to hone descriptions. I also like the various detailed filter options. My only issue is that, even though I am no longer looking for a house rental, I am still getting updates. I turned off all notifications and erased that search. 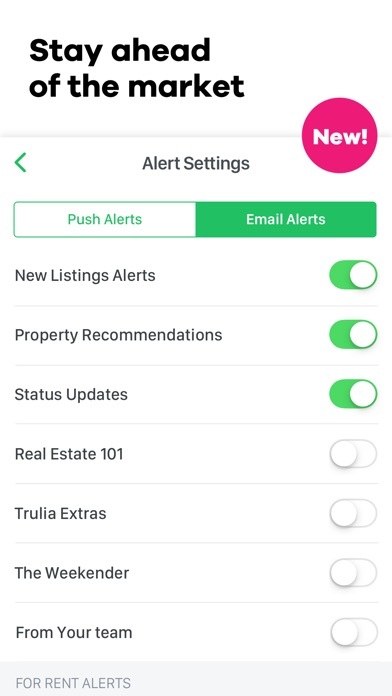 It is slightly annoying to have my alerts filled with homes I do not want to see or need. Cons: The major issue I am having right now is that the app won't recognize that I've changed my alert settings. It keeps showing me homes for rent in an area that isn't in my saved searches, and I have unchecked showing homes in the surrounding area. I am purchasing, not renting. Currently, when I try to go to the alert settings it gives me an error message and shows a blank screen. Pros: I enjoy this app for its street view, and it gives more information than other home search apps don't have. Sometimes it even lists homes before Realtor. The price drop alert is a great feature. Other than that, it does what all the other similar apps do. Needs better pending and sold info without having to load the whole page. What a waste of time with incorrect info to deal with. This is a great app. Unfortunately some of the homes on the list were sold over 6 months ago. Update the status on the homes. The ‘favorite’ feature needs work. It takes an act of congress for me to be able to favorite and unfavorite a house. I have to tap it four or five times for it to work, and as someone who is on this app every day it has gotten very old very fast. The draw feature on the map also yields no search results somehow. Easy to use and provides a lot of info. I really like this app but as recently as 4 months my saved menu doesn't show up all the time it shows it as if I haven't saved any homes and every once and a while it shows up. I just find it to Inconsistent for my taste I've kept the app in hopes that you guys will fix the problem. The app is not picking up many homes that are on the market in my area. I have to go to the individual realty companies to see homes for sale. The app shows houses in your feed not even close to any of your search criteria. In addition, if you try to save homes, they don’t even appear in your saved homes! What’s the point of having the function if it doesn’t work? Tried signing in and out with no avail. Valves way off mark has no grip on sales trends or buying trends. Incorrect info on homes not trustworthy. The mapping is all wrong... searching a certain zip code and gives me a different address. Needs to be fixed. Had homes saved in Texas. All have disappeared and the app states that I haven’t saved any homes, although I have!!! From my last review 5 years ago, (rated a 1 star) the app had progressed positively. Now, I’m back to giving it a 1 star rating again. FIX THIS. Need my homes back!!!!!!!!!! I really like this app. However, I would like to see some of these home post more than one photo. Otherwise, the virtual tours are great. Gracias por tanta información para conseguir casa y poder comprar. The house I was interested in was listed in the wrong area so it was listed as an appraised value totally wrong. Great app that is super easy to use. This is by far the worst real estate app out there. Add the ability to hide ones we don’t want! The trulia app has never worked on my phone. The only settings I selected are max price of $2,900 a month for a rental and to have a dog. It always tells me “no results” even when I look within a 40 mile radius. Then when I go on my laptop and use Trulia’s website I have a ton of results. So what’s up with the app? I do not recommend it. The new color ramp for Crime Info is useless. The green-to-red was perfect and easy to read. The new shades of blue are difficult to differentiate quickly and make me think someone without a cartography background made the decision to change it. First stop for property search. Provides great information and a starting off point towards your home venture. Easy to use and the listings are current. I love how it allows you to get updates about price reductions or any status changes. Much better than some of the others apps out there. I used to exclusively use this app until it forced me to update and now it doesn’t open homes emailed to me which is useless. The only way to find those homes now is to do a manual search and that’s not saving me time. I think I’ll delete this app and will use another one. Please fix the saved homes feature so that they can be edited and deleted when a property is sold. Many many "map views" are off by miles, sometimes by entire towns. It’s a very easy application to use. They won’t let me edit details to my home. False info and old photos cannot be removed. Reckless company. I thought Zillow was bad but Trulia is worse. Oh I just find out they are the same company now. Go figure. Even spoke to the prior agent who sold me the house and now they are getting involved to help remove old info. Lawsuit would be easier. Seems to help give balanced market values and provides easy to view details. I do wish it would bring up more-specific area details, as in only homes for sale on a certain street. It may be that I don’t know how to use it properly. But right now it seems it displays all the listings in a city, even tho I’ve typed in one street address. Easy, Fast and Smart App to buyers and sellers... You can try it and you will not be disappointed. Thank you Trulia! Had no listings in the area I wanted to search. Played with filters and still nothing. Zillow has hundreds. I was looking in Puerto Rico. Where ever I am I can rely on trulia to pull up properties. So I downloaded the app a few days ago but it doesn’t work. Keeps saying “please check your internet connection and try again”. Sure would be nice to actually be able to use the app instead of having to get on the website. This was my preferred app for looking around for homes, especially because I could save listings to a board that was shared with my significant other. Now that Trulia removed the board feature, there’s not any great advantage to using this app over any other real estate apps. Love looking at houses inside and out. But it keeps sending me houses in Illinois! Why on earth it’s decided I want to live there, I just can’t figure out! My searches are clearly in my area. Tried fixing it, no go. Anyway, cool app and tons of houses! I now have found my last two homes on trulia. One was beautiful lake house and then a huge move cross 7 states and it was just as discribed on trulia. Thanks trulia for a free app and all your hard work. God bless. Don’t know if this is a Trulia or Apple issue. Since the most recent update I can’t see photos on my phone or pad. I even deleted and reinstalled the app in both devices. HELP!!! Won’t let you set prices ranges that aren’t preset. Looking at the map I see stuff and then go to draw the area I want and then it tells me there is nothing there even though it just showed me a bunch before I drew. I love that I can do searches. Look at crime in the area. I can keep ones to look at again by pressing on the heart to mark it as your favorite. Need to have garage listed. Need to have pictures of all sheds and garages..well listed..age... How large land is.. Roads dirt or near pave roads.. If it is in subdivision and have restrictions...have pictures front ... back ...sides.. If sold take it off!!! Other wise love it.. not wanting to do surveys... was in mont and left for a sec went to California. I’ve had Trulia for a year, the only app dealing with Real Estate I use faithfully. The information alone, buying a home is top notch. Trulia real estate app is by far the best, I’ve ever used to find a home. It’s useful and easier to navigate compared to other apps. The listings go up a bit later but if you aren’t looking in a super hot zone where days matter, it’s a pretty good app. There needs to be a cancel for request information and the DTI meter I think is backwards too. There definitely need to be some fixes but like I said, it’s easier to navigate. Also, foreclosures, more are listed on this app than the other apps I use, and they more often than not, they pan out to still be up for sale. I actually type the addresses into Zillow, as they sometimes provide pictures inside. Trulia provides a street view always so you can get a rough feeling on how the neighborhood is and if the house needs a lot of TLC on the outside or not. Trulia’s maps of disaster, crime and what not are extremely useful and accurate thus far. It has its flaws but it also provides some aspects other apps don’t. Listings on here are 80% out of date, the crime stats do not coincide with the ones on realtor.com so unsure what to believe, and as has been said MANY TIMES, the alerts/recommendations are nowhere close to what I have put in my saved searches that I am looking for. Not surprisingly, most realtors get upset that you are even using the app. Wish there was a feature where apartments you are not interested in would no longer appear in your search results. Using an iPad mini 4th gen and you’d think it was an iPad 1. Between the description, list of important facts, and the pictures, it’s the BEST! I can assess my needs and likes very easily! Thank you! Generally, I love Trulia...except for the one frustration I have. I have tried repeatedly to delete some searches, but I continue to receive notifications for them. I’m sure it’s me, but it’s not an obvious fix, since I still haven’t figured it out yet. I couldn’t redo my password. Every time I tried to reset the password the email reset wouldn’t work. Yhe app on the phone doesn’t even offer any accessibility to reset password. At a loss for words. Love how similar this is to the real site!! This app is perfect for looking at houses in Florida! I’ve lost track of how many properties I’ve driven to go see and it turns out they don’t exist. There used to be separate lists that were organized. Now it's one huge list that is not conducive to efficiency. I'll keep it until the next update to see if they unscrew themselves and add the separate lists back, if not app is gone never to be added back. I am a successful Realtor, have a new home sales company and rehab homes as well. This is the most effective way to educate yourself about a specific market in just minutes. I HIGHLY recommend to all buyers and sellers as well. I enjoy using Trulia every day! You guy should put the trulia houses in categories since you guys took out the boards, to make the app convenient and organized for all users to use so they don’t have to keep scrolling down to find a specific house The users could just go to the category like for example “Westmont IL” and bam that house your looking for is right there. I specifically disallowed the app from using Location Services, yet when I open the search, it zooms right to my house. I double-checked my settings in Privacy, and sure enough, it’s set to Never under Location Services. Either the app is making an extremely lucky guess or it’s ignoring Location Services settings, which is a real privacy issue. I took a star off because of the new update for saved homes. All my saved homes are gone and when I save new homes I can’t find them anywhere. An excellent application that has all relevant features to properly display some of the greatest homes at their best. Trulia literally has the best houses! Just house looking but my husband and I are talking about house hunting. Use it daily searching for deals! I think trulia has it together. I am worried that the feeds are being throttled or controlled everything seems slower and more difficult to find in Washington D.C. 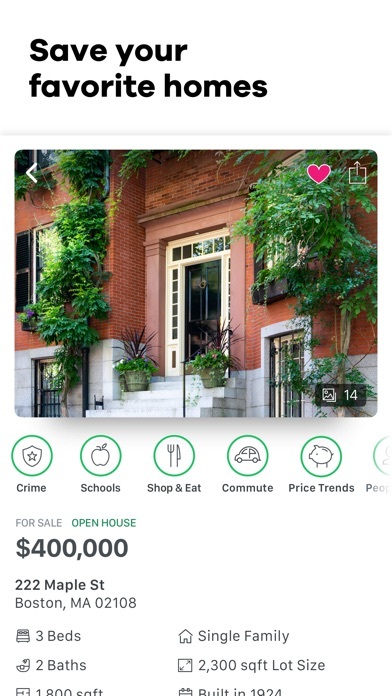 This is app is good, but I think it could be better if you include the tax history on each house and comparable homes that are listed and sold. FIX THIS APP!!!! It’s like it was made by elementary school kids taking a coding class for the first time. So many bugs, technical errors, and just a mess!!! And for YEARS without improvements. WHY?!?! The app closes as soon as it opens. Like 2 seconds. I like how it show you almost everything you need to know about the house and it has pictures to show you as well and past history and ect.... gotta love it!!!!! This is the worst app on my iPad. Regardless of the version of iOS I am on, it routinely shuts down in the middle of a home search and freezes up when I am searching using the map. Better to use the full website - ugh!!! I’m in the middle of a search. I’m looking at a house. Suddenly! As if on cue! The app whisks me out of my view screen and asks, “do you like Trulia?” Uh, no, no I don’t! And if you click YES it sends you to the iTunes Store to leave a review. If you click NO it shunts you into a feedback form to force communication with their developers. If you take me out of my flow to demand feedback, I will give it to you. And you won’t like it. I don’t like the Trulia app. I hate it for its inappropriately-timed begging for feedback. I dislike the fact that you can’t clear or escape the Recommended properties. I think the crime view is fairly inaccurate based on downplaying crime wherever you’re searching, but I could be wrong about this aspect. Aren’t you glad you pushed me to leave feedback, Trulia? All the facts I need, right on my phone! I use it a lot... but I feel the user experience can be improved dramatically on mobile and on the browser - it can be a bit glitchy and slow at times... but overall is great! The mobile version is not very good. I like this app for property searches. You get so much info and mapping that on my laptop or phone would bog down the realtor.com app and take it way longer to go through many listings. The downside is that Trulia doesn’t dig deep as in HOA and what the fees are. It’s almost like you use Trulia for scanning an area or region and then when you find interesting listings you use another way to find out more info. The point for quick scans is to do as much searching without having to call and get fifty questions from a realtor before you can get any minor answers. So yes, I’d recommend the Trulia app and site but I wish they had more useful data. Amazing app that helps you get into the real estate world. Great site. My only complaint is showing me houses that are no where near where I’m looking to buy a house. And it’s also hard to give you feedback/ask for help. Thanks! I use this app to find the house that I purchased. If you zoom too far in and back out all the listings are missing. The only way to fix it has been to kill the app and restart. We’re on the hunt for a house & this app is my go-to! It’s accurate, thorough and the layout is user friendly. I so Love and Enjoy viewing all the homes . Will not let me sign in with my account. Every time I try to log in with my email and password it wants me to sign in via Facebook. I disabled my Facebook account so I can’t do that. Therefore it won’t let me save searches. Not user friendly at all. Filters constantly change back, so annoying. Layout is the worst of the real estate apps. This app is not for landlord’s, property managers or owners who are trying to post it’s looking for tenants. This is only for people who are looking to rent or buy. Don’t bother trying to contact the listing agent through the app electronically. You’ll be sold to a random real estate agent as a lead. I’m staying in NJ. And I get alerts for rental homes, that too in the area of San Jose. Also, based on my search criteria, it should bring more townhomes / condos. But most of the news feed in my login shows Single-Family homes. App really needs some major improvements. It’s got a lot of good info! And more listings than Zillow. I regret making the update. Neighborhood designations are now cluttering the maps. I find the app extremely buggy to a point of unusable. Each filter option behaves differently. Worst of all filters get stuck. I made an unfortunate decision to show schools, eg elementary, middle etc. They were not useful, so I turned them off. The green boxes became white (off) but the darn “green peas” of school locations remained on the map! Now I am stuck with them. Closed an rep opened the app, uninstalled reinstalled - same result. I am on iPad Pro. Advice to the developer: test on multiple devices, shell out for a professional UX Designer, and usability-test your app. You’ll be surprised how poorly it performs in term of speed of data loading and in general UI comprehension by users. The Trulia app is very helpful and easy to use. My only complaint is that they removed the school district filter, which makes searching take less ne’er than it should. It would also be helpful if they added garage spaces as a filterable option. My iPad has iOS 9something. The Trulia update doesn't work with that. Even an older version doesn't. I have two choices, buy a new iPad or use Zillow. Guess what I picked. Great app for searching for property. Very user friendly and I particularly appreciate searching via the map option. The only thing missing (hence the 4 stars) is a map that shows the outline of property lines. Helpful for the most part. it just doesn't work. I press the app, it loads then exits. I deleted it, downloaded again and same thing. I'm using an iPad. Please fix, I'm looking for a house. So Trulia is one of the most BEST housing apps EVER.It’s a app that helps people find or sell houses. I live in California and every time we find a home we want, it’s a 55+ community, please add option to avoid these listings, it would make for much faster searches and would make your app more effective. Best house hunting app ever! It provides every info you need to know when looking for a house. Please REMOVE this site from this phone!!! Please REMOVE this site from my phone!!!! This app is once you got it it NEVER leaves your phone! Along with never being able to use it! It’s a VERY POOR site! I love how easy it is to use the app. However I find that a lot of listings have not been updated, however when they do update it, it takes a day or two to upload. I used to love this APP. Now I hate it. You took away all my boards with personal saves organized. Why would you take away the one feature that made this one worth keeping. So disappointing. All my favorites. Gone. It’s horrible now..not even worth a star but I’m required to chose one.. Using my iPhone 6s Plus. I can’t search for any listings anymore. Nothing shows up, even though the on the map interface the app states there’s an x amount of places available. Only way around is to use to website (not the app). The Zillow app wouldn’t give me these problems. Love looking for our dream home/property on here. Trulia is my go to app for home searches! Two years ago we bought some land to build on. This year we found a lovely house. Easy to use and very informative. Love this app. Love the ease of locating properties on this app. This app was ok (often late on the postings) but now apparently people just put whatever acreage they want. So when you're looking for places with more than 2 acres you get a lot of false postings now. It's a pretty big waste of time. It's a shame. Really loved the app. Now it doesn't even open. This app was the best that I’ve come across for house hunting. It was great when you could save to boards that you create to suit your needs (for us by location, but could be by size, price, or whateve). It’s what set this app apart from other real estate apps. They did away with that. Now everything is saved into one big file, just like other apps. The map view is now glitchy as well. This app used to work very well but as of a couple of days ago it won't even open on my iPad. I tried deleting and reloading but that didn't fix it. I powered off my iPad in hopes that would clear out anything that might be hanging it up but still won't even open. Trulia app has been crashing immediately upon attempting to open ever since the November 7 update. Please fix. Nothing worse than getting an app update and it requires you to log back in. Since the last update this app keeps crashing on my iPad3. Completely unable to open and use. Anyone on the other end working to fix this? I even deleted and reinstalled the app, still crashes! Please fix! The app won't open anymore even though I uninstalled it and re installed days later. Also you can't delete saved homes from the app. I am unable to open app after November 7 2017 update . You can't unsave homes once you save them. If I could rate it higher I would. Everything you need to know about a property is listed! We are looking to move to the hill country in TX and this site has been my complete go-to for house hunting. I can’t imagine how you’d make a move without Trulia. Got contacted by 20 brokers when I only reached out to one. My only gripe so far: why is it SO HARD to save and i save (with hearts) on the interface?? There is an indication that I tapped the heart, but nothing registers on the system... Otherwise, I love this app! Great site for first glances. Just hoping your info is up to date. However I do use your leads. Good for real estate first search. Lots of info. Better than most apps to gain a perception of the actual real estate, neighborhood, and basic data. This app simplifies the home search. Love it! Every time I press the back button from a house’s profile it automatically reloads the list, sending me to the top of the page. It’s incredibly annoying and not worth my time. Your biggest achievement over any other app I’ve used is the Crime tab. It’s really great for me, since I’m looking at moving to a downtown area. There’s plenty of personalized searches, and it can be made as specific or unspecific as I choose! I find this app much easier to use than Zillow. Other Apps are following and starting to add features this App has offered for a long while: neighborhood crime maps, schools in map, commute times, flooding areas, shopping in map. I can go and on... Try it and you will agree... invaluable tools we had to get from different sources in the past. With this tool, you can make better informed decisions. The misplacement of actual locations when looking at the map drives me crazy. For example- when looking down town ??? ?, Texas for an older home to purchase there are homes that are actually 5 miles away in a cookie cutter neighborhood. But the pin is set in down town. It’s frustrating. There should be a way to check the accuracy of these locations before they are allowed to set the pin of location. I used to think it was on the up and up but when I recently came back into the market for a house or apartment I noticed they have a widget called “Local Legal Protections”. Trying to insinuate that if you’re LGBTQ then you might get unfairly run out of the town because there’s no state legal protection. Grow up. I’ve tried three times to draw my (very wide) area and all I get is “no homes meet my criteria”! Toooo hard to figure out. I’ll go back to Zillow. My only complaint is that when a house is taken off the market it still listed on the app. Other than that it’s a pretty convenient way to browse through houses and property. The search on Trulia is 100% useless. The times I have tried to search for anything it never finds anything to view. It comes up 100% empty every time. The only way I can view any properties is with what it feeds me. Terrible. When I search in nj or a broad view I have no clue what I am clicking on. Tried downloading older version since I don't have 10.0, but still keeps closing. UPDATE TO iOS 11 or Stop sending me email!!! I love this app so good!!! The setup is good and very interactive, it bugs out often when selecting houses on a map though.. The app sends notice of a potentially perfect home then crashes when I try to open it. Repeatedly. Frustrating waste of time. Incessant requests to rate and review the app. Once they implemented this latest update with boundaries I can’t do anything without accidentally clicking one. Please make this an optional interface so I can still use this!! They give far more info to individuals who are looking for a home. The HOA fees that are normally not mentioned has been on each Home listed. You have to know how much all fees are so you can make an informed decision! Easy to use and seems to have quality photos. I like how intuitive the app is, and it’s suggestions are always reasonably pertinent to what I am looking for. I also appreciate how well it integrates with my phone and existing tools I use on all my mobile devices. Great App and solid service! Helpful and not frustrating. The search app is well laid out and informative. Trulia is the best way to hunt for homes on the web. What don’t I like about trulia. Trulia app is very good and always up to date , but what I hate the most is when I move the map the prices disappear then re-appear again . Unlike other apps the prices stays when I move the map an inch or two. Website and app are super glitchy I'm annoyed af. Ever since zillow took over it's like no one over there cares about trulia....app hasn't been had an update in who knows how long. The map doesn't work. The links don't work probably. The page won't refresh. I'm not using this app or website until I revisit this feed and it seems to have improved. I'm literally soooooooo annoyed with big companies who just take money and don't put it back into their product/service. This app is great. My only complaint is it is extremely annoying to tap on a property to find that the photo slideshow begins on a random photo rather than the first photo (which is usually just the exterior). I find that it shows me say, the 12th photo so then I have to scroll all the way to the beginning of the pictures in order to get the “walkthrough” feeling of scrolling the photos. This app is great but there is NO WAY to clear the Recommended updates in the feed! Out of curiosity I searched for houses in a town that I wasn't considering moving and now, despite many searches since, I cannot remove that town's updates from the feed! I deleted the app, signed out, restarted -- yet this town and the unwanted recommendations still show up almost exclusively. It makes the Feed section of the app useless. Why no control over the recommendations?? All you'd have to do is add a function that allows you to *choose* the recommendations you want. An otherwise great app is ultimately too frustrating to use because one of the most important functions is too irritating, not helpful and a time waster. WAY too many alerts/emails It's like a virus. I used all of the time because we’re looking for homes. But the app just spins when I try to view a home on my iPad since a guess an app update happened. Very frustrating! I will just have to use Realtor.com. I wish Trulia would have thought out the impact they were having on iPad users before they made app change! Can't use it. Crashes upon launching or within a few seconds after. Sad. I love this app and all the detailed information. Doesn’t listen to your preferences at all!!! You open the app and have recommendations from Place you don’t want, not in your price range and not the amount of bedrooms your looking for. My searches are saved but doesn’t matter. The app will not load. Loved two versions ago. The last version was slow but worked. This one won't even load. nice visualization on map, easy to search with filters. the only drawback is that it does not stay current with status of a home in the market. what shows pending may be already sold and what shows as available may be already pending. so to that extent it is recommended to check the site from the realtors to double check. We enjoy how Trulia sends us updates of new listings, as well as older listings, from the specific area we are looking in. It is very handy. Truila is a great app, but should add schools to the map. Crashes before it completely opens on my old ipad. Simply excellent. You can get all the informations you need about buying, selling or renting for any locations you want. Amazing!!! I almost moved to the "Nawfside", luckily Trulia offers all the demographic information I need to avoid areas infested with minority residence. I love scrolling through pics of million dollar homes and imagining I live there. - WAY too many alerts/emails - Skip the celebrity updates. The people who use your app have to work hard for their money (unlike celebs). Still -- overall good, informative. Better by far than realtor.com or Redfin. App crashes a lot. Properties are not updated. Most are sold or pending. Easy to filter search results, and overall clean app. Couldn’t give it 5 stars because you are unable to removed saved homes from the app. They can be removed, but they always come back. Very frustrating. Good Site. Would like to be able to delete alerts once they are viewed. The homes that include photos covering the inside & outside of the property, in full, are the only ones that interest me. LITERALLY JUST DOWNLOADED 5 minutes ago. First, it’s a pain to have to sign into an app JUST TO VIEW HOMES LISTED FOR SALE. I get it. It saves you time and shows you your “preferred” results. WHATEVER. You made me go through the whole process just to boot me and MAKE ME REDO IT. NO THANKS. Get your stuff together, Trulia. Spend more on the actual app than commercials. Of new listings. Thank you! The app recently started crashing on ipad, but not on iphone. What's the deal with that? i don’t like the whole boundaries on the neighbourhoods, i press it by accident all the time since this update. I use this app on the daily to look at houses and have used this app to move into a home before. I like that it asks residents their opinions on the area they live in as well as information on parking, how festive the neighborhood is, etc., and that it shows the crime rate in the area of a particular house. It answers most of the questions you have for a realtor before your actual appointment with them! Well thought out and easy to navigate! The only problem I have with this app is with the houses I have saved that are no longer available or off market. I can’t remove them from my saved list. I have tried over and over but I can’t get the houses to fall off of my saved list which is irritating because then my saved houses that are currently available get buried under houses that haven’t been available for months. Other than that, I love the app! I wish I knew Fort Wayne better, but this app is good. I could tell you more if I had an idea of the shopping center’s near by. But there are many technical errors that happen all the time. For instance, once a home has been sold and is off market, you can’t take it off your list. Super annoying and just makes the app feel and look really cluttered and inefficient. Notifications are always inaccurate and pictures won’t load sometimes. I feel like these things could be fairly easy fixes but I’ve been having these issues the entire time I’ve had the app. Going to uninstall and try Redfin. Suddenly will not open. At all. Just as I really needed this app to work, it stopped. Crashes as it's opening every single time. Trulia was always superior to me, but I need to find a place immediately and so Zillow for the win! Sorry y'all, fix the tech issues and I'll be back. Unless, I find a place to live in this ridiculous housing climate. You may have time! I have every real estate app I can find. Zillow is the last one to list homes as contingent or pending. They also don’t hide the foreclosures. I don’t want to at this time! Lots of times while using the app, I will search for a certain town. Then somehow I end up in the middle of the ocean near Africa. Very odd. Otherwise, informative, simple and easy! There really needs to be an option on the search page to hide results. Tired of filtering through the same no-info, no-picture listings. I can't even open the app any more. If I get notifications on my phone I can't see anything but a green screen. On my iPad it just won't open at all from any where. I used to love this app. Now I can’t stand it....it never scrolls correctly. Once I get to the bottom it just brings me back to the beginning even though I haven’t seen everything. The settings change and don’t stay the same. It crashes. It also doesn’t show every listing. One minute a listing is there and the next minute it won’t come up. Even though it’s still for sale and I just saw it. It’s become such a disappointing app. This app is making it really easy for me to only see what I’m looking for via the search results but also shows badges of maps and safety and neighbourhood things that also go into the search for a place to live. Using this app is probably the easiest decision in the whole apartment hunting adventure! I appreciate the easy-to-use filters to refine my search whenever I want too also. Please fix the Saves feature to show list of hearted homes. Anytime I click on saves it shows no homes. You can search by price range, location. You get alerts which helps you be informed of availability. Happy with this application. This is a great app. To view and see what is being offered. Pictures are so nice but what I like most is the description of the home and in some instances the surroundings of the neighborhood. Look at app every day. I love trulia app for looking at houses around my area and out of town! This website is very user friendly! Love it easy to navigate and lot of good information. I used this when I bought my house and it was great. Now, won’t connect. Keeps saying to check my internet connection. Every other app on my phone works fine. Including competitor apps. This app just says I have no internet connection. Cellular or WiFi. You make my dreams real!!!! Can you please change the map colors back to the old version?? It’s really hard to see with all these blue colors. I have to zoom it every time I’m looking at a property. The old map was way easier to use it! Great help with finding renters and listing rentals... a go 2 for both sides! So far it is exceptional. It is a great app, but we find ourselves jumping in and out of the app to navigate to rentals or properties we are interested in buying. I always browse real estate every morning, but recently I’ve found myself using other apps to do so. Every time I use Trulia I scroll so far and for some reason it automatically scrolls to the top of the list again and I’m forced to either end my search or go back through an extensive list and hope I find my place again. This has been ongoing for weeks now and is incredibly frustrating, and really makes the app almost useless. My home purchase is one to two years away however, this is great for looking at comps and also alerts me when a home matches my previous searches! When hovering over the map to check house there’s a photo glitch. (I’m a use House 1 & House 2 for example) If I’m on photo 7 of House 1 while still hovering over the map and click House 2, it takes me to photo 7 of House 2. This is a very annoying problem, Please Fix. I live in this app it’s great! I love being able to see what homes are available that fit my needs and wants at all time .